Micromegas, an inhabitant of one of the planets that orbits Sirius. His home world is 21.6 million times greater in circumference than the Earth. Micromegas stands 23 miles tall. 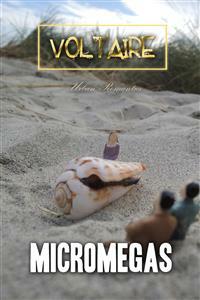 When he is almost 450 years old, approaching the end of his infancy, Micromegas writes a scientific book examining the insects on his planet, which at 30 m are too small to be detected by ordinary microscopes. This novel can be seen as an imitation of Gulliver’s Travels. It contains many allusions. The dwarf of Saturn is Mr. Fontenelle. Despite his gentleness, his carefulness, his philosophy, all of which should endear him to Mr. Voltaire, he is linked with the enemies of this great man, and appears to share, if not in their hate, at least in their preemptive censures. He was deeply hurt by the role he played in this novel, and perhaps even more so due to the justness, though severe, of the critique; the strong praise given elsewhere in the novel only lends more weight to the rebukes. The words that end this work do not soften the wounds, and the good that is said of the secretary of the academy of Paris does not console Mr. Fontenelle for the ridicule that is permitted to befall the one at the academy of Saturn. The notes without signature, and those indicated by letters, are written by Voltaire. The notes signed with a K have been written by the Kehl publishers, Mr. Condorcet and Mr. Decroix. It is impossible to rigorously distinguish between the additions made by these two. The additions that I have given to the notes of Voltaire or to the notes of the Kehl publishers, are separated from the others by a —, and are, as they are mine, signed by the initial of my name. From micros, small, and from megas, large. B. Certain geometers, always of use to the public, will immediately take up their pens, and will find that since Mr. Micromegas, inhabitant of the country of Sirius, is 24,000 paces tall, which is equivalent to 20,000 feet, and since we citizens of the earth are hardly five feet tall, and our sphere 9,000 leagues around; they will find, I say, that it is absolutely necessary that the sphere that produced him was 21,600,000 times greater in circumference than our little Earth. Nothing in nature is simpler or more orderly. The sovereign states of Germany or Italy, which one can traverse in a half hour, compared to the empires of Turkey, Moscow, or China, are only feeble reflections of the prodigious differences that nature has placed in all beings. This is how the text reads in the first editions. Others, in place of “geometers,” put “algebraists.” B.
 I restore this sentence in accordance with the first editions. B.